Barbara Lunsford has graciously shared with me all the case documents and photos which she acquired on her own initiative and her own dime. (Thousands of dimes, actually.) One set of photos was described as Preston's Apartment. That collection consisted of 14 interior and 2 exterior shots. For now, I offer only the 2 exterior shots. Consider the photos carefully. 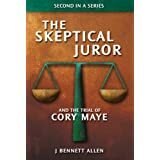 There is exculpatory evidence here, and there is mystery. I offer 10 points for the first person to explain why they photos are exculpatory. I offer 10 points for the first person to identify the mystery. 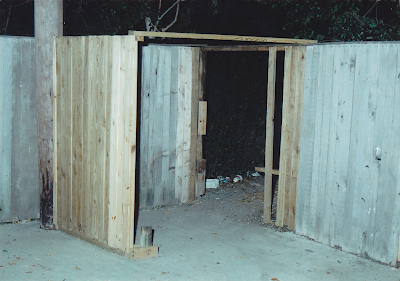 I offer 50 points for the first person to explain (to my satisfaction) why the HPD took these photos. This is an open book brain teaser. Feel free to search the HPD police reports, any of my previous posts, the interior photos Barbara has already posted online, Google, Bing, etc. 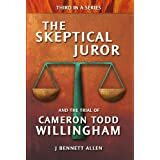 I award Matt (from California) the 10 Skeptical Juror points for being the first to mention the photos were taken at night (or very early morning) though the police photographer claimed he got the call at 8:30 AM. Hale's police report indicates to me that he received the call to head over to Preston's apartment at about 8:30 AM. Whether he is off by a little bit or not, there can be no denying at that time of year that the sun would have been up for some time. 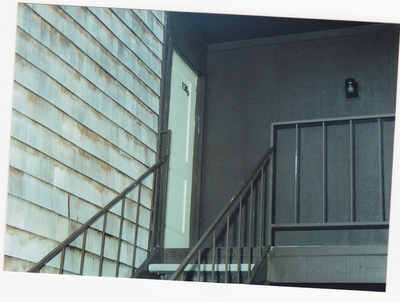 But the pictures of the stairs leading up to his apartment and of his front door were both taken well before sunup. Seems like the times do not add up at all. 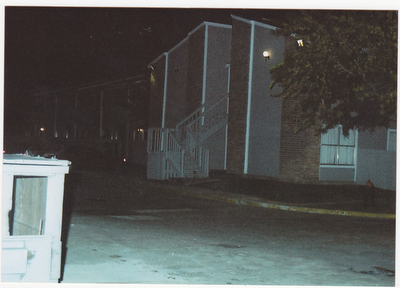 The darkness is exculpatory because it impeaches the HPD claim about their search of Preston's apartment, particularly when coupled with the 2:42 AM log in time for the evidence collected from his apartment. Preston claims the HPD planted Shandra's glasses in his apartment, then faked the Voluntary Consent for Search and Seizure form. He was certainly right about the form being manufactured. (See Documents Gone Wild.) 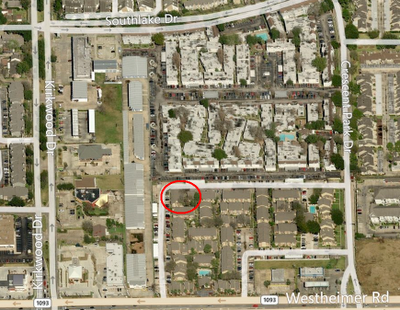 The HPD, on the other hand, now seems to have lied (one again) about when they searched Preston's apartment. I award Rene vd Berg (from the Netherlands) the 10 Skeptical Juror points for being the first to recognize that the two photos were of different buildings. 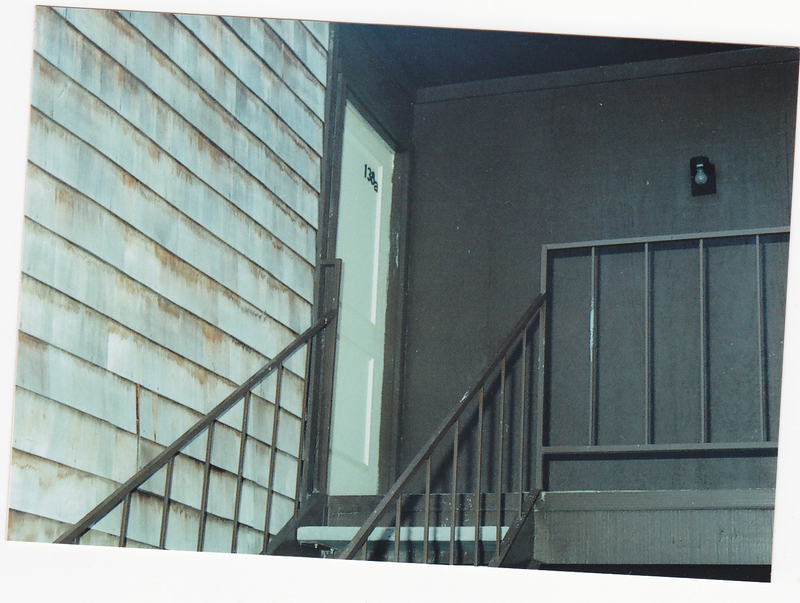 first photo is from a different house taken at night for the reason stated above,staircase is wooden.second photo is taken bij daylight,light is unlit en must be taken at the actual search.later was not possible because of the police sealing of the house, which must be visible after the search,the stickers ribbon etc. Not only are the two staircases different, the two buildings have different siding material. I disagree with Rene, however, on the timing of the photo. Though it is not as obviously taken in the dark as is the first photo, I believe nonetheless that it was. Consider the shadows cast by the right hand railing. They are crisp and dark, as if the railing was being illuminated by bright direct lighting such as a flash or a spotlight. The shadows are not faint and indistinct as they would be if illuminated by early morning, post sunrise, diffuse lighting. Consider also the darkness underneath landing at the lower right of the photo. The fact that the photos are of two different buildings poses a mystery in three parts. 1. Given that only the second photograph is of Preston's apartment (as per the address), what building was captured in the first photograph? 2. Why was the building photographed? 3. Why was the photograph included in response to Barbara Lunsford's request for all the photos associated with the case of Preston Hughes III? Fifty points still remain to be awarded to the first person to solve the mystery. I can (and will eventually) provide a specific answer to the first question, but I can only speculate regarding the second two. I will therefore award the fifty points to anyone who provides the correct answer to part 1 of the mystery, and 100 bonus points to anyone who can provide a definitive answer to parts 2 and/or 3. I hereby award Rene vd Berg (from the Netherlands) the fifty points for properly identifying the building in the first photograph. 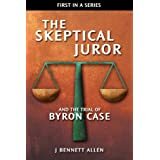 That gives Rene 60 Skeptical Juror nugatory points total. Not only is Rene now in the lead as an individual, Netherlands is now in the lead as a country. This is, in my unbiased opinion, bigger than all the ice skating gold medals I anticipate they will win in the upcoming Olympics. I offered 50 points for this portion of the brain teaser because it required not only observational skills (limited to the documents I present in my post) but investigation mettle as well. Rene relied on Google maps to search both the Lakehurst apartment complex (where Preston lived) and the Lakewood Village complex (where some other interesting characters lived). I search both Google maps and Bing maps. 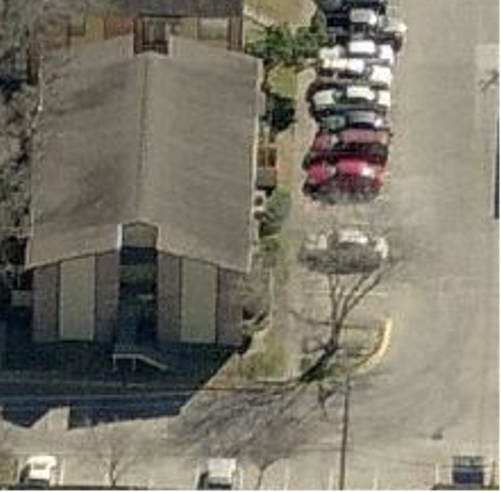 I found the best view of the building from Bing's bird's eye view. I've circled the northwest apartment building in the Lakewood Village complex. Rene identified that building as the one in the first photo. It's not at all obvious from this satellite view. I'm not sure how Rene homed in on that building, but I magnified to the max allowable, then scanned each of the complexes from multiple directions. I did so in both Google Earth and Bing Bird's Eye. 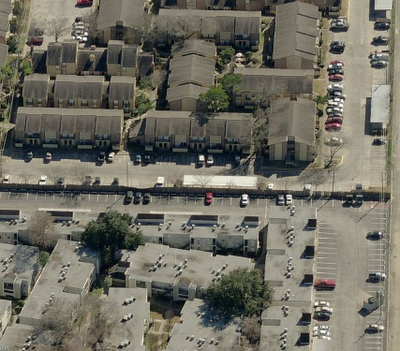 Here's a better shot, looking from the south, using Bing's Bird's Eye view. Then I clipped the image and magnified further using Gimp. Here's the best shot. It's a bit blurry due to the latest magnification, but you can clearly see the staircase, the distinctive design of the front of the building, and even the metal container still in the lower right corner. The clincher for me was the quarter-circle curb to the right of the building. I find nothing close anywhere else in either complex. That is certainly the building in the first photo, so I awarded Rene the 50 points. I do not, on the other had award any points for providing a compelling explanation on why the photo was taken and included in the package sent to Barbara Lunsford. Rene suggested it was simply take to provide a general view of the region surrounding the hole in the fence. See? The photographer must have been standing just on the other side of the fence at the left of the screen. But why? I have some thoughts, but I want a definitive answer. The 100 bonus points remain to be won. I suspect they can be won only by someone with intimate knowledge of the building or the HPD. Speculation is nonetheless welcome. 10 Points for Matt in California. The darkness is inculpatory evidence because it impeaches the HPD claim about their search of Preston's apartment, particularly when coupled with the 2:42 AM log in time for the evidence collected from his apartment. Preston claims the HPD planted Shandra's glasses in his apartment, then faked the Voluntary Consent for Search and Seizure form. He was certainly right about the form being manufactured, and the HPD seems to have lied about when they searched his apartment. That's an interesting comment Rene because the first picture is definitely not the same view as the second one. And the second one is really hard to tell from the lighting what time of day it is because it could be real or artificial lighting. The first picture could make sense if he took a photo of the surrounding buildings from the crime scene. Were the pictures discussed at trial? I was trying to look through your posts and see if you had pictures of the two apartment complexes at the fence. I didn't see on my first glance. Since there are two complexes right there it would depend if Lakewood Village had the closest building to the fence opening. If they had the closest building then it would be photographed near the area. i think that the first photo has been taken from the north west corner of the lakewood complex looking south east.the object just left looks like the garbagedisposel which is stil in place today ( goolemaps).the roofline corresponce ,with notch, also look at the vert.lines, bricks wood. the wooden staircase is also the same used in the lakewood complex. Those were your words. You also stated that the earliest the officer could have been there is 15 minutes after the stabbing. You really try to make a great point, but really, did you intend to leave out the part where Sandra arrived at the hospital still alive? What happened to ‘…will die soon thereafter’? Certainly, if she was still alive at the hospital, she had plenty of energy to tell the officer who the killer was. Good grief. Your entire case falls apart on your first point. What is this, amateur night at the Apollo? Where is the evidence that Shandra arrived alive at the hospital? She was declared DOA at Ben Taub. In case you are not aware, that means dead on arrival. Ha ha, it seems that Anonymous above might be a past or present member of the Houston Police Deaprtment. He certainly has the investigative skills for the job. She was alive because her pictures at the morgue show her all tubed up. The hospital would have not tubed her up if she was DOA. Dah!